After ordering a new mirror for my telescope I decided that I ought to make a new mirror cell. With my posh new telescope mount, my old cell looked very tatty and desperately in need of a make-over. I have a reflecting telescope. The primary optical element is a parabolic mirror about 8 inches across and about 20mm thick. This mirror needs to be properly supported. If the mirror was simply supported around the edge, the middle would sag under its own weight, deforming the optical surface and causing aberrations in the final image. 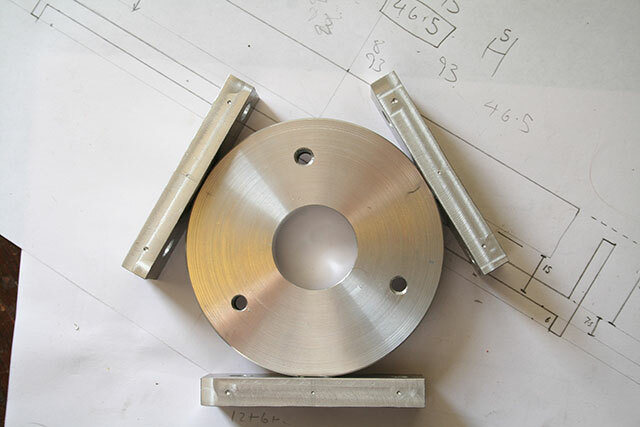 The traditional way of supporting a mirror is to make a multi point suspension cell. The mirror sets on a grid of 6 or more points that pivot and rotate. The points are carefully positioned to cause the least amount of deformation. The mirror is then simply glued to this cell with silicone glue so that they mirror is free to flex in changing temperatures. The larger the mirror, the more points you need. A large 24 inch mirror may require 18 or 24 suspension points. A smaller mirror like my 8 inch only needs 6 points. The exact positioning of the points can be mathematically calculated using a bit of software called Plop. One Plops one's mirror on one's cell. Making use of the spare bits of metal I had kicking around, I machined a 93mm diameter aluminium circle, and make 3 rockers attached to the circle by stainless steel shafts pivoting on small bearings. A lot of cells just use screws as the pivots. 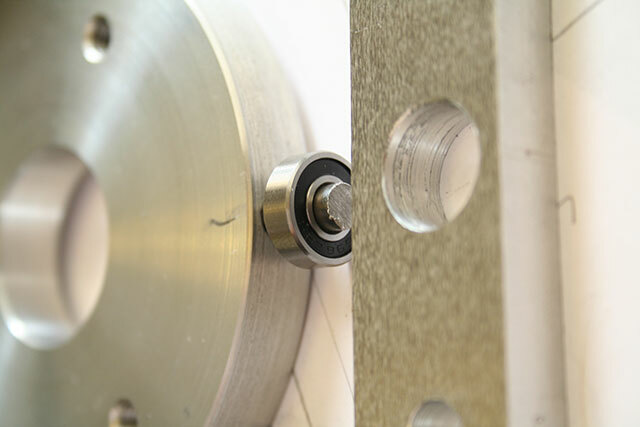 It is not difficult to include bearings in the design and I feel it makes the whole thing more precise. Each rocker is marked with a spot where the mirror needs to be glued on. A small rubber O ring will be added on each point to raise the mirror above the rocker. The next stage is attaching the cell to the back of the telescope and providing a means of collimating the mirror. This is very poor season for Astrophotography and astronomy. It doesn't get dark. It is raining. Very difficult to do any astro imaging. To keep myself sane, I've been looking through my data from last year (2010) for anything I've not finished off or published. During september, I took a lot of data in narrowband of the Heart Nebula with the intention of creating a mosaic of the area. Whilst I got some good narrowband data for the Heart Nebula, I only got the hydrogen alpha data for the Soul nebula section. The weather soon deteriorated and I lost my enthusiasm for the project, so data for the two corners never got collected. As I've gone back to more high resolution imaging this year, it is very unlikely that I'll get the data needed to complete the scene, so I've dusted it off and posted it in monochrome. The IC1805/IC1848 Heart and Soul complex (featuring the Rolling Stones Nebula) is a vast area of nebulosity on the border of Cassiopeia and Perseus. The field presented here is around 4 degrees across - which is about 8 moon diameters. This means that this region appears 8 times larger than the full moon in the sky - if only our eyes worked better! The data for this image is all captured using an Artemis 285 CCD camera and a 135mm M42 SLR lens (£5 on ebay) on my LXD55 telescope mount. An Astrodon 6nm hydrogen alpha narrowband filter was used. Autoguiding using a 1000mm guidescope with a black and white chipped SC1 webcam. The data was collected across several nights in September 2010 during a period of good weather. The mosaic is made up from two separate shots. The upper right shot is a 9.5 hour exposure, made up by combining 900s sub exposures. The lower left panel is a 9 hour exposure, again, made up by combining 900s sub exposures. Total integration time is 18.5 hours. Moonlight interfered with the Soul nebula section, hence the loss of depth in that area compared to the upper right frame. The image below is resized down to 640 pixels wide. Click here for the 1024 pixel version. Click here for the original resolution version. The collected data for each panel is median combined in Maxim and the post-processed in photoshop. Final construction in photoshop. NASA have been busy with the construction of the James Webb Space Telescope, the successor to the Hubble telescope, and have released a few tasty images of the telescope being put together. At least, they are tasty if, like me, you enjoy making your own astronomy equipment. The James Webb telescope is a lot larger than Hubble. The HST has a primary mirror with a diameter of 2.4 metres. The mirror on the JWST is a multi segment 6.5 metre design. This means that is has a light gathering power around one thousand times the power of the telescope I have in my observatory. This mirror is designed to work in the visible and near infra-red wavelengths. The James Webb telescope is intended to work more in the infra-red, hence the pretty gold mirrors, which reflects infra-red well. The mirror segments themselves are made of beryllium coated in a thin layer of gold. My telescope on the other hand is made of rather more mundane plate glass covered with a thin layer of aluminium. Unlike domestic mirrors, the reflecting surface of a telescope mirror is always on the front, not the back. Although we are familiar with the visible light images from Hubble, imaging in the infra-red is far more interesting for science. Infra-red light allows us to see through the dust and murk in outer space which sometimes hides scientific targets. Most land based telescopes have to work in the visible and near infra-red spectrum because the water vapour in the Earth’s atmosphere tends to absorb a lot of the infra-red light. In another departure from Hubble, the James Webb telescope will not be parked in the conventional low-earth orbit. To shield the detectors from infra-red light from the Sun, the JWST will be parked in an orbit around the L2 Lagrangian point on the other side of the Earth from the Sun. Thus the Earth acts as a giant sun screen. This makes telescope operation much easier, but does have the downside that no servicing missions are possible with current technology. The Lagrangian points are regions in space where the gravitational attraction of large orbiting bodies (i.e. the Sun and the Earth) is cancelled out - making quite a nice hideout for a spaceship. This image shows us part of the mirror assembly at the testing facility. Before committing the telescope to launch, each part of the assembly must be tested by cryogenically cooling and then heating the telescope to test how it will respond to the extreme conditions found in space. I enjoyed this shot of the engineers working on the mirror segments. IT is quite funny that you see a mundane object like a litter bin (bottom left) next to all the high technology. The Hubble Space Telescope has produced this fantastic close up image of part of the Centaurus A galaxy. Centaurus A, known to us Astronomers as NGC 5128 is 11 million light years away in the constellation of Centaurus is not visible to us Astrophotographers in the north, so it is a delight to see a "foreign" object for a change. This galaxy is extremely active with lots of exciting star forming regions. 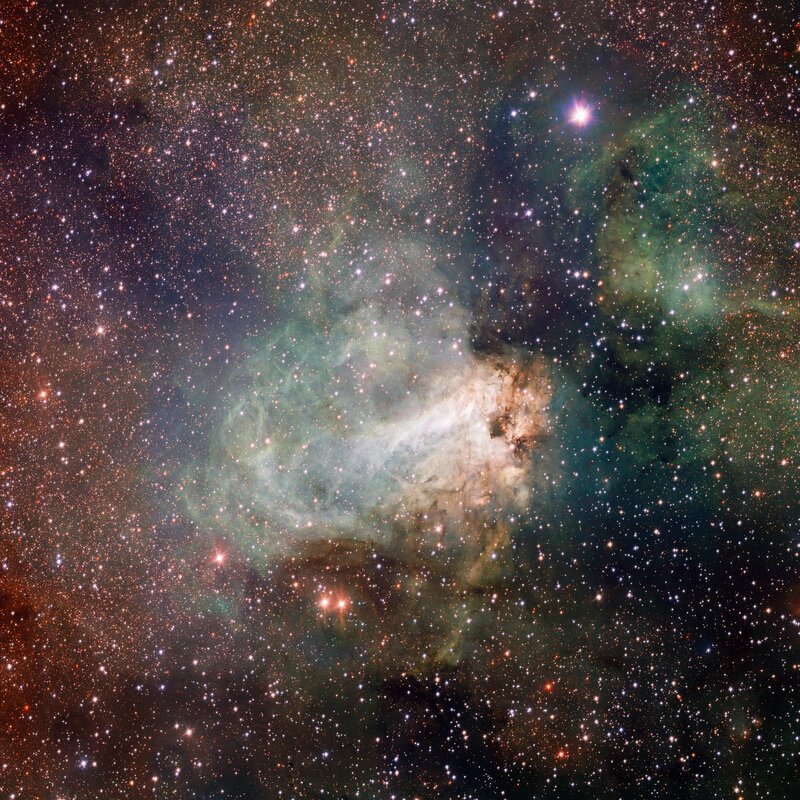 However, its appeal comes from the large amount of dark dust lanes that cross our view of the galaxy and hide some of the millions of stars in the galaxy. Hubble has really gone to town on this one with the Wide Field Camera 3 which was installed a few years ago in the last shuttle servicing mission. Seven different filters were used to make up this image. Data from different wavelengths, from the violet all the way through to the infrared have been combined to produce this image. This is the most detailed image ever taken of this region. The bright pink/purple regions are intense star forming regions similar to some of the active nebulae we image in our own galaxy with our hydrogen alpha filters. The orange/yellow areas show older stars, some of which doubtless orbit around the super-massive black hole which resides at the centre of this galaxy. The second image shows a crop of the full sized version. Here is a serious contender for Astronomy Paper of the Month. This paper uses a very simple and elegant argument based on data from existing astronomical observations and star catalogues to disprove the dark matter theory. It does so by lending significant support to the idea that a few tweaks to the Newtonian equations of gravity remove the need for Dark Matter and Dark Energy. I'm uncertain if the paper has been properly refereed, but it is an interesting read. Dark Matter was invented by cosmologists to explain "missing matter" in the universe. Various large scale cosmological phenomena, such as the speed of galaxy rotations, do not sit well with the laws of Newtonian dynamics unless the galaxies contain a lot of unseen mass. General relativity doesn't help either. As cosmologists can neither see nor directly prove the existence of this mass, it was christened "Dark Matter". Hopefully we all remember our school physics lessons. The force of gravity decreases with the square of distance. Proponents of MOND (MOdified Newtonian Dynamics) claim that this rule changes at great distances (i.e. at very small accelerations). For our Sun, this means a distance of 7000AU (1 AU = distance from Earth to Sun). Unfortunately It is troublesome to go and measure the force of gravity in this location so a less direct proof is needed. A lot of the star systems in our galaxy are binaries. Two stars orbiting around each other (remember Luke!) at great distance. The insight of the authors in this paper was to realise that the motions of stars in very wide binary star systems could be used as test cases to see if the law of gravity does need modifying at large distances / small accelerations. We can't simply observe a wide binary (where the two stars are separated by 7000AU) around its entire orbit (usually several centuries), so we have to make an inference based on the observed proper motion of the stars. Their argument thus becomes a little weakened at this point, but no less convincing. They also make various attempts to "break" their argument by using different data and subsets of the data, but the hypothesis is not disproved. They conclude that the motion of wide binary star systems points strongly to a need to modify Newtonian gravity. As the distance between the two bodies increases the force moves from the Newtonian inverse square rule of GM/r2 to a form of GaM/r. This means the orbital velocity of wide binaries should cease to decrease with separation and gradually settle on a constant velocity which is only dependent on the entire mass of the star system. Perhaps we can view gravity as having two separate components, with only one operating on the inverse square rule. Or we can view it in the same way as light. There is a minimium unit of light enery (the "quantum") so why can't we have a minimum unit of gravitational energy? If it can be proven that the equations of classical gravity need modification at low accelerations, then there is no need to invoke Dark Matter to explain the universe. A lot of mainstream cosmologists strongly resist the idea of MOND solutions whereas I quite like them. Perhaps I need to do a nice rant against dark matter! Another night with the telescope this saturday. Continuing to test out the homemade telescope mount - this time with some images. After improving the backlash on the telescope mount last week it was time to test again with some longer exposures. The testing needed to see if I had improved the guiding in declination (DEC) with my mechanical adjustments. I also need to test the CCD camera. I'd had the camera apart a few days ago to clean the sensor and hopefully cure a noise problem. I've also made some mechanical adjustment to the telescope mirror cell, so I need to check the field illumination. When we are this close to summer solstice, the nights are very short. It never really gets properly dark, and the sky glows brightly all night. For this reason a hydrogen alpha filter has been used for all testing. The Ha filter only lets through light at the extreme red end of the spectrum. The sky is blue - therefore this filter helps block out the skyglow. Another advantage is that the longer wavelength of light are less effected by the turbulence in the atmosphere. First target was a shot of M13, a large bright globular cluster in Hercules. 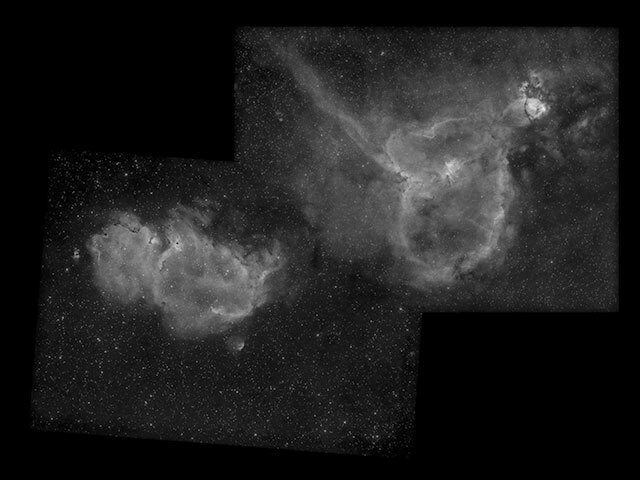 This image is two exposures of 300s which have been combined. Total integration time is 10 minutes. 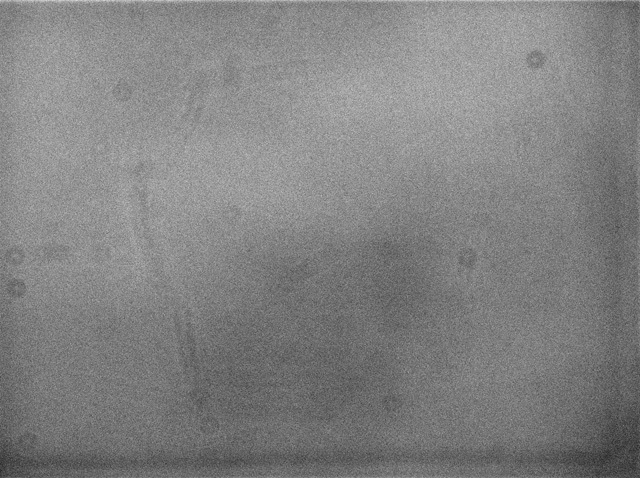 Obviously such a puny integration time is going to give a very noisy image, but it would appear I'm better focused than on previous tests, and guiding looks improved. I then moved across the sky a bit to the Elephant Trunk Nebula region and did a single 1200s exposure. Again, everything seemed to be working about right. Now it was getting on for midnight, and about as dark as it was going to get, so I moved back to the same pelican region I'd use on the previous test. I managed to stay awake long enough to complete 3 x 1800s exposures. I've tried to do some further post processing on this dataset but the it seems that the sky glow has really washed out the contrast. The moon being around didn't help either. Moving on to the other tests. During twilight I pointed the telescope at the sky and took a few very short exposures to so how the flat field was looking. The answer would appear to be "quite good". Although there is some dust and scratches, plus a smudge, there is hardly any classical Newtonian vignetting. Finally, I've been suffering some some nasty diagonal banding on my images from the CCD camera over the last couple of years. The camera is a kit build Artemis 285 with a Sony ICX285 sensor. This camera became the Atik 16HR. The bias frames used to be very good, but deteriorated a few years ago. I think I've pinned some of the problem down to a dodgy earth on the 5v regulator. Below is a before and after image of a cropped region of the bias frame. The one on the left is before and the one on the right is after. The diagonal banding is still visible on the right hand image, but is much reduced. Another evening in the observatory playing with the backlash on the homemade telescope mount. All these long evenings are dreadful for astronomy, but give you lots of time to tweak the equipment. During the night time test the other weekend, I discovered huge backlash in the gears - both in the RA (right ascension, i.e. left and right) and the DEC (declination) directions. The backlash in the DEC was making it impossible to autoguide the telescope properly. On measuring the values the other day, I found the DEC backlash was a huge 362 and the RA was at 169. Terrible. However, after some tweaks, I seem to have improved it. Setting the backlash is a bit of a phaff, you have to sight the telescope on a distant object. Such things are in short supply in my garden, so I have to find a chimney pot behind a tree. You then have to move the telescope around a bit under computer control until its little brain has learn the backlash in the gears. Anyhow, DEC backlash now measures 27 and the RA 52... so greatly improved. In a month or so we might see some stars to try it out on! Still in Chile, and we heard today that the VLT survey telescope has just started to produce some results with its vast 238 mega-pixel camera. This imaging system is located next to the VLT scopes we saw in the video in my previous post. The VLT suvey telescope is going to undertake 3 major surveys overs the next 5 years resulting in a catalogue of over 500 million objects. Compare that to your average amateur GOTO telescope with a catalogue of about 50,000 objects! This photo shows the camera itself - looks to be the size of an armchair. Slightly bigger than you average DSLR camera! It weighs in at around 770kg and contains 32 separate CCD sensors making up it huge total pixelage. The 2.6 metre aperture ESO telescope has a staggering 238 mega-pixel camera giving something like a 1 degree. Pretty amazing. I really enjoyed this video of a day and night cycle over the very large telescope. The Atacama Desert plateau in South America has some of the finest conditions for astronomy on the planet. Only the summits of Hawaii and the polar plateau in Antarctica approach it. Therefore astronomers have built several telescopes in this region to take advantage of the perfect skies. The ESO Very Large Telescope (VLT) is unsurprisingly one of the larger telescopes. Until the 30 metre class scopes start coming on line, the four 8 metre class telescopes of the VLT is one of the most powerful instruments on the planet. A thought struck me today. Why don't telescopes have electric focusers? It has taken a long time to make my own telescope mount. Over the years I've snapped quite a few photos of various parts of the telescope mount as they have been made. I've gone through a few years of images and copied about 60 of them into a simple gallery of images. I really need to do this properly, and add some description to each photo, but that is going to be a long job. However, you can see my first collection here. 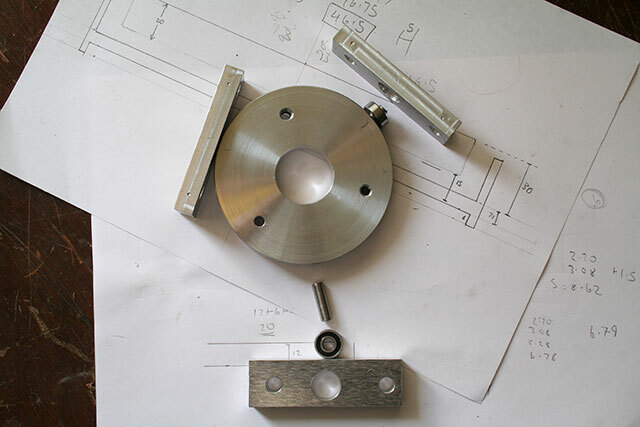 As you scroll through the images you will see various parts of the telescope mount in various phases of construction. There are some more recent shots of the mount in my observatory, and other shots where you can see parts of the telescope mount being made on my lathe. Apologies if some of the older photos of the telescope mount parts are a bit fuzzy, I've only had a decent camera for a couple of years! I promise to put in a better gallery soon! The main 200mm diameter F5 telescope mirror in my Newtonian telescope is getting rather old. Almost 10 years old. The telescope wasn't the greatest quality telescope in the world when it was new. It was branded Helios, which was the forerunner to the more familiar Skywatcher telescopes. Although a lot of time has passed, the fundamental design has not really changed. Because the old mirror has spent many years out of doors in the observatory, it was started to seriously deteriorate. Looking though the back of the mirror, I'm surprised it reflects anything. With the new telescope mount, it seemed proper to get a better mirror. One of the foremost telescope mirror shops in the UK is Orion Optics. They sell a 8 inch F4.5 mirror for about £300. I asked them if they would make me a one off 8 inch F5 mirror, and was told this would be an extra £160 re-tooling charge on top of the cost of the F4.5 mirror. That didn't seem to be a sensible use of funds. The next obvious route was to buy an 8 inch F4.5 Orion Optics telescope mirror and simply slice 10cm off the bottom of the telescope tube. I pondered this one for a while, but was still put off by the cost. At the back of my mind I know I'm going to build my own larger telescope at some point in the future and it seems a bit silly to invest in an expensive mirror now. I asked a couple of other UK telescope mirror makers, and they all quoted impossible sums of money. A new telescope OTA from Skywatcher seemed the simplest fix. However, buying a new 200mm OTA sounds like an inefficient use of cash – I’d end up with a lot of hardware I don’t need. The £300 cost of a new OTA is close to the cost of an 200mm F4.5 telescope mirror set from Orion. All I have to do is chop 10cm off the end of the OTA! Spending £300 on an OTA from which I’m going to pinch the mirrors also has to be weighed against the option of getting one of their £400 10 inch OTAs. However, I don’t want to rush out and change instrument without consideration to my next camera. The final option is recoating my mirrors – this doesn’t give much change from £100 after vat and postage. That seemed like a daft option as I don't know what else is wrong with the old mirrors. After dithering about this for a few weeks, I contacted Bern at Modern Astronomy, a great UK supplier who often comes up with creative solutions to my problems. He actually managed to get a price out of Skywatcher for a replacement telescope mirror. Whilst it has a lead time of 2 to 3 months, the cost is acceptable. This is just the primary mirror. There are various UK suppliers for secondary flat newtonian telescope mirrors, such as Orion, who do a 50mm flat for about £50. So in a new months the new telescope mirror will turn up and we shall have some brighter images! I am a great fan of webcams and I have always used them in my astronomy and astrophotogaphy. One of the most effective places to put a webcam on a telescope is the end of your finderscope. Many people like to operate their telescopes from indoors or remote locations and I do not know how they manage without a webcam finderscope. Telescope finderscopes are small telescopes attached to larger telescopes. 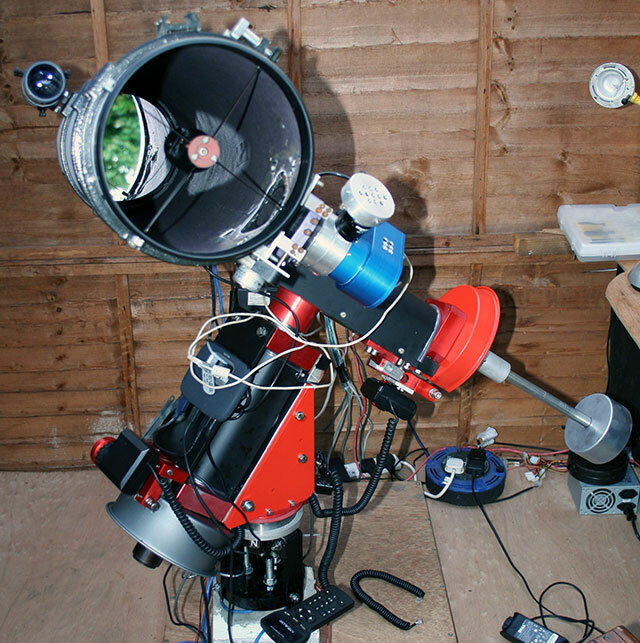 The finderscope has a much larger field of view than the main telescope, and as such can be used to help the astronomer aim the main telescope at a target of interest. 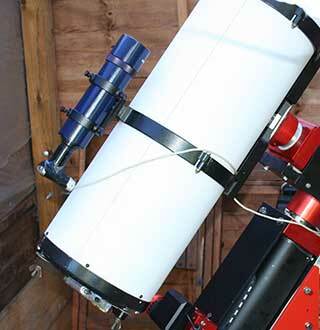 Telescope finderscopes are often mounted at around head height on the top of the telescope OTA so that the astronomer can easily look down the finder without bending his neck in 6 different places, however, they are still be uncomfortable to use. Once you start trying to remotely operate your telescope on a GOTO telescope mount you will often find that the telescope GOTO system does not always land your astronomical target on the sensor of the CCD camera. In these situations I find it useful to sync the telescope GOTO with a nearby bright star, and then do a GOTO my astro target. But how do you get the bright star on the CCD camera sensor? Well, you look up the finderscope! This doesn't sound very good for remote operation, so what I do is have a webcam attached to the finderscope where I could normally put my eye. Unlike most astronomical applications of webcams, you do not remove the standard lens, you leave it on. You just fix the webcam in place on the end of the finderscope with the webcam lens about where your eye normally goes. The output of the webcam now looks just like the view you get up the finderscope - cross hairs and everything! I can normally see stars down to about Mag 6 using this method - more than enough to help me get a bright star on the CCD camera and sync the telescope GOTO system. You have to turn up the exposure etc, but it does not require any modifications to the camera. I attach my webcam to the end of the finderscope using a piece of plastic tubing I found which slips tightly over the finderscope - I have simply glued this to the webcam. Without the webcam finderscope I could not be able to remotely operate my telescope observatory. A futher advantage is that you are free to position the finderscope where you like. I have mine bolted to the top of the tube rings down by the mirror end of the scope. Here it is more out of the way. In this position the finderscope helps to counter balance the weight of the CCD camera attached to the focuser of the main telescope. It is uncomfortable to eyeball the telescope finderscope in this position - I always use the webcam. Fascinating paper from the Astronomy and Astrophysics journal on the most distant comet observation with a telescope. Use the 2.2m ESO telescope at La Silla, the observers have stacked 26 x 180s exposures of the distant comet Hale Bopp. The distance is around 30.7 Astronomical units, or 2,850,000,000 miles in more local terms. Comet Halley had been observered at around 27 AU distance, but these new observations beat that record. Comet Hale Bopp has been extremely active, but these recent telescope observations show that the comet activity is now in rapid decline. Some scattering from a light coma was detected, but the comet is now almost in deep freeze. We ought to be able to continue tracking Hale-Bopp with the worlds largest telescopes until around the year 2020 when the magnitude falls below mag 30 and pickign the comet out of the background galaxies becomes impossible. Although I enjoy a naked eye observation of a comet as much as the next person, I've never been particular interested in imaging them. However, this type of observation is in a different class of astrophotography. Simply finding the damn thing must be a challange. The researchers noted that the comet appeared slightly out of the predicted position in the sky, but comet revealed its nature by a slow movement against the background stars. Hale-bopp wil be back in our skys in the year 4385, so don't wait up!